SMU provides students the opportunity to attain knowledge, embrace global citizenship, achieve personal mastery, and acquire intellectual, creative, and interpersonal skills. 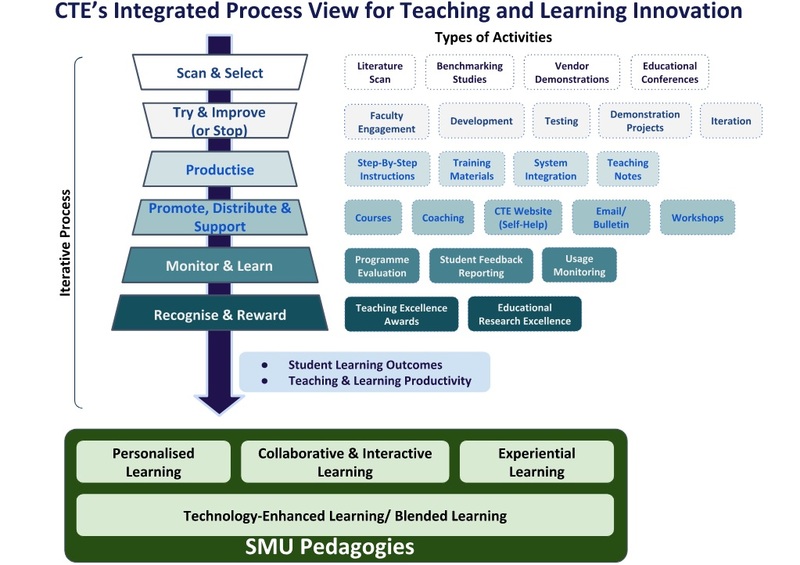 To help students achieve these learning outcomes, SMU implements pedagogies that are personalised, interactive, experiential, and enabled by technology. The Centre for Teaching Excellence (CTE) supports SMU faculty members in delivering these pedagogies. We collaborate with the Provost Office, the Dean’s Offices, the Office of Postgraduate Professional Programmes, the SMU-X team, the SMU Libraries, and the Integrated Information Technology Services to bring the best teaching practices to the largest number of faculty members and students. Teaching is an evolving profession. Hence our mission is to engage, develop, and empower our faculty members to advance their teaching using evidence-based practices. To help identify and adopt such practices, we help to scan the environment, select good ideas, try them out together with interested instructors, and, when proven effective, make it easy for more instructors to adopt them. We also promote, distribute and support the best practices while monitoring outcomes and recognising and rewarding teaching excellence. The diagram below shows this integrated process view of CTE’s activities. While not pursuing technology for its own sake, SMU actively seeks out, experiments with, and adopts technology to improve outcomes. CTE’s role is to provide funding and support for faculty members to explore, subscribe to, and develop useful new technologies. CTE also serves as a “digital innovation greenhouse”1 to nurture new technologies, in collaboration with instructors and students, to a point where they can become a part of SMU’s teaching and learning systems. As CTE aims to develop teaching and learning at SMU based on clear evidence, we also support interested faculty members who conduct educational research. The educational research performed by SMU faculty members further informs the centre’s activities and plays an important role in shaping SMU’s transformative education.